Spray-Lock Concrete Protection (SCP) products fill capillary voids by reacting with calcium hydroxide found in concrete to form Calcium Silicate Hydrate (C-S-H). By filling voids, SCP products stop liquid water transport and reduce water vapor transmission. This void-filling action is important to consider when concrete will be receiving coatings or stains. 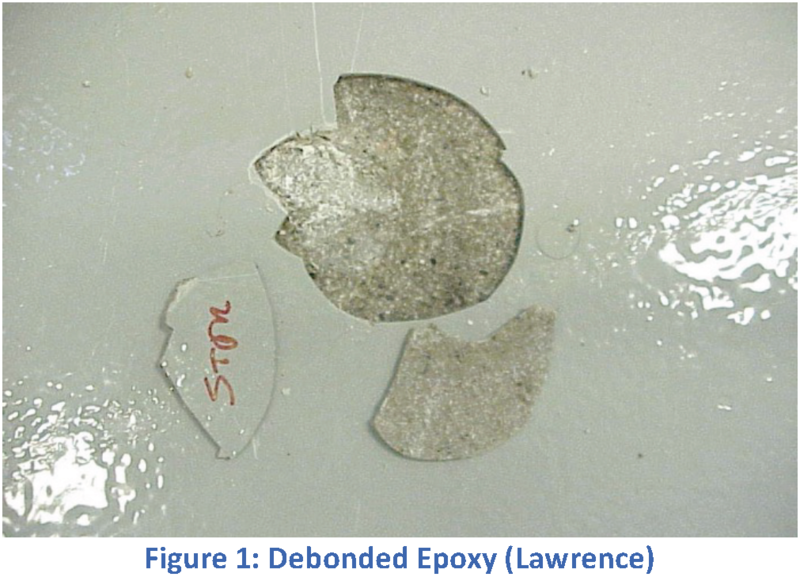 Most coatings that are placed on concrete (epoxies, cementitious, urethanes, acrylics, and polyureas) depend on mechanical bond to perform well. 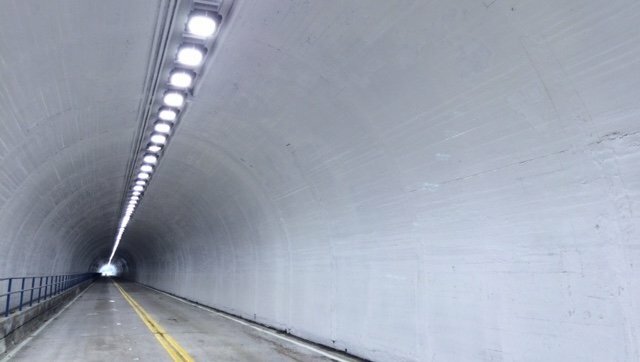 Because SCP products penetrate the substrate concrete’s capillary void space, the mechanical key present at the concrete/coating interface is undamaged and in some cases improved. Once coatings are bonded to concrete, contractors and owners depend on the longevity of that bond to dictate the life cycle of the coating. Two common mechanisms that affect the coating’s life cycle are water vapor transmission and liquid water movement, both of which can deteriorate the bond between coatings and substrate concrete . 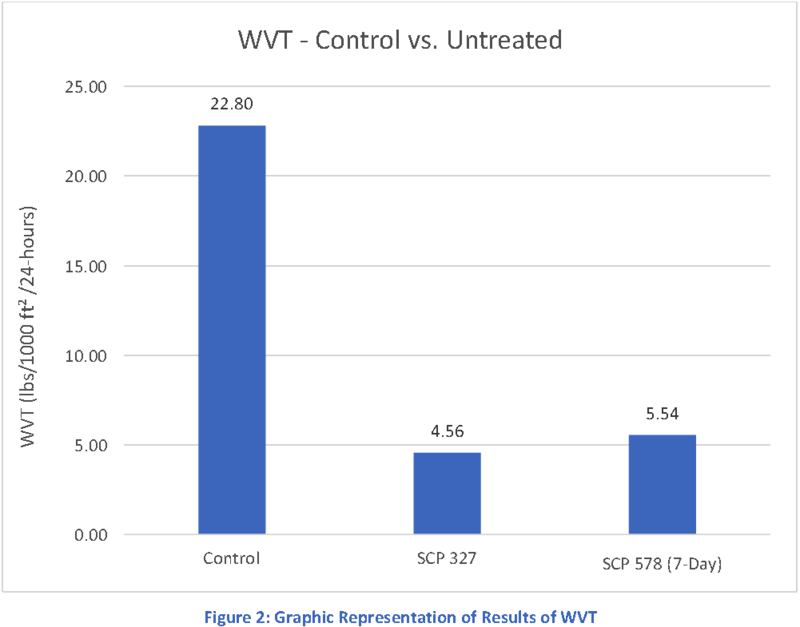 By stopping liquid water movement and significantly reducing water vapor transmission, SCP products can significantly improve the performance and life expectancy of coatings. Several coating manufacturers have specified SCP products in the past to act as a moisture barrier to ensure proper performance of their coatings. 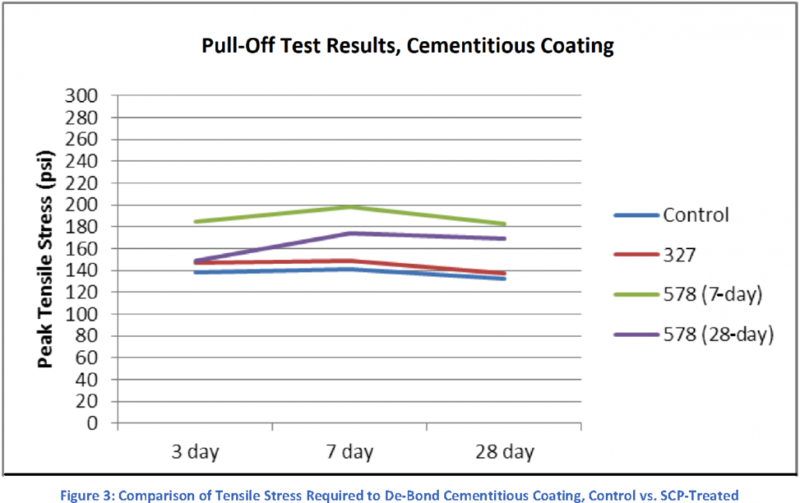 Independent laboratory testing has demonstrated SCP products’ performance improvements on coatings, as well as years of successful projects. Nine test panels of poor concrete with expected high-water vapor transmission (WVT) were cast and tested to ASTM E-96-10 (water method). Two additional sets of nine panels were cast with the same mix design and then treated with SCP products before also being tested to ASTM E-96-10. Results of that testing are show in Table 1 and Figure 2 below. Twenty-seven more test panels were cast with the same mix design with two sets of nine panels treated with SCP products. These were then affixed with a cementitious coating and tested to ASTM C-1583 (pull-off method). Results of this testing are shown in Table 2 and Figure 3 below. The testing information presented above demonstrates that SCP Treatments may improve the bond strength of coatings. Additionally, SCP products can help extend the life of most coatings by restricting water vapor and liquid water transmission. 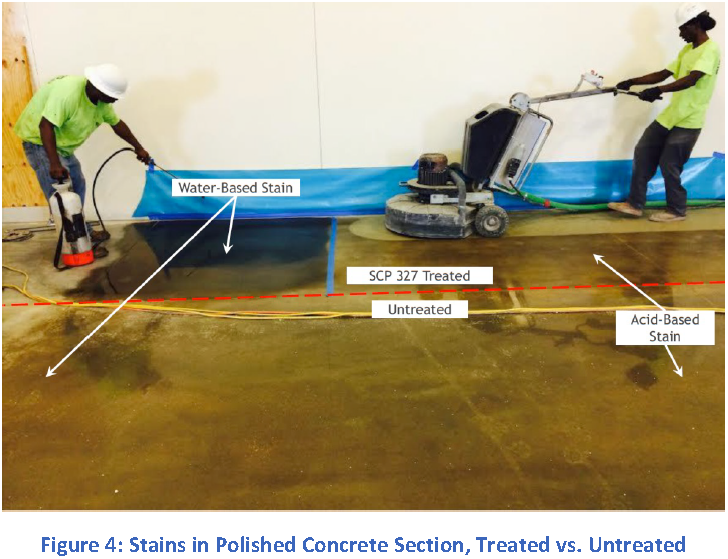 Because SCP products fill capillary voids, water-based concrete stains are generally not recommended for use on treated concrete. Acid-based stains and solvent-based stains may demonstrate some limited effectiveness. SCP products have not been tested with all stain types and manufacturers, so SCP recommends testing the performance of proposed stains with mock-ups before proceeding with a project. 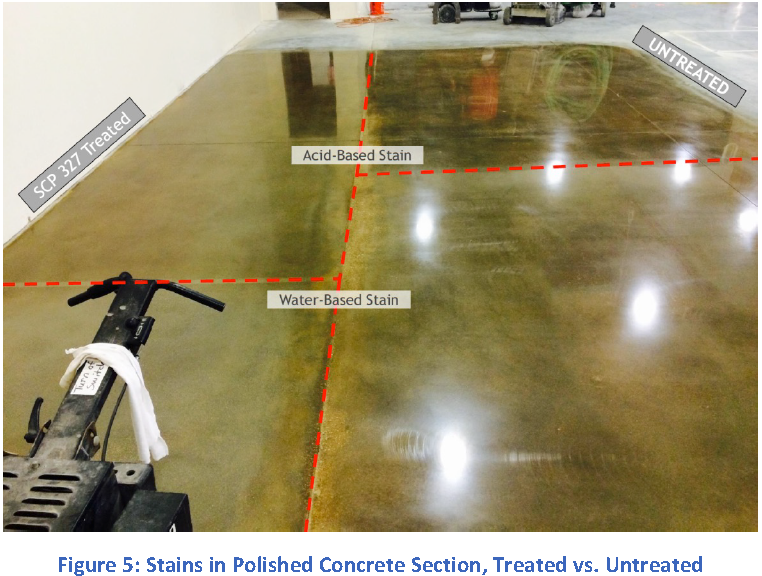 Figures 4 and 5 show some typical differences in untreated versus treated concrete that have been subjected to surface stains. In general, SCP products function as expected given that a Portland cement concrete has been placed and no conditions that inhibit the penetration of the SCP products exist. SCP products, when applied properly, will have no detrimental effects on the bonding of coatings that do not require penetration into the capillary void structure of concrete. 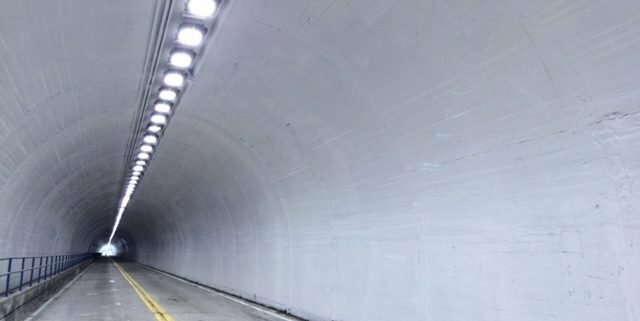 They penetrate beyond the surface of the concrete, so properly applied SCP products leave no bond-breaking residue on the surface of the concrete to interfere with coatings. By limiting liquid water and water vapor transmission, SCP Technologies can extend the life cycle of most coatings in most situations. However, because SCP Treatments fill capillary voids, the effectiveness of stains should be subjected to trial placements before proceeding.